A well-kept secret will finally be revealed this morning shortly after the opening ceremonies for the 2011 Iowa State Fair. A large sculpture made of butter will be unveiled at 9 a.m. along with the usual butter cow display. Sarah Pratt of Norwalk has been the Fair’s “butter cow lady” since 2006. 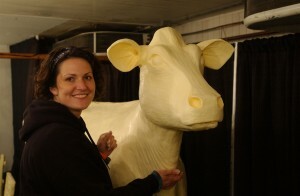 She’s refused to give any hints as to what she’s created in addition to the cow, but she told Radio Iowa it’s the biggest butter sculpture she’s ever made. “It’s probably the biggest in the sense of how much butter it’s taking. I’m guessing close to 1,250 pounds of butter,” Pratt said. This year mark’s the 100th anniversary of the famous butter cow being part of the Iowa State Fair. The cow is often accompanied by another butter sculpture, but this is the first year it’s been kept as a secret until the first day of the Fair. Pratt’s putting a lot of work into this year’s butter sculptures. She started three weeks ago, working up to eight hours or more a day – six to seven days a week. That work is done in a cooler that stays at a temperature of 42-degrees. Any colder, Pratt says, and the butter gets too hard to mold. Any warmer, it melts. The 34-year-old Pratt learned the craft of butter sculpting from Norma “Duffy” Lyon – who served as the Iowa State Fair’s “butter cow lady” for 45 years. Lyon died of a stroke in June of this year at the age of 81.